Oops - we don't appear to have a video for the fi-4340C. Scanner's been very good. Reliable, efficient and has helped towards us lowering the costs associated with our Data Management System tremendously. 5 out of 5. At speeds of 40 pages per minute (ppm) in mono simplex and 34 pages per minute (ppm) in colour, the Fujitsu Fi-4340C document management scanner offers maximum performance at a midrange price. A 100-page automatic document feeder and a daily duty cycle of 4000 A4 documents allows continuous scanning and improves operator productivity. True 600 dpi charge coupled devices (CCDs) provide high quality imaging. Sophisticated dithering and error diffusion algorithms improve halftone rendering. The Fi-4340C is available with Fujitsu's proven Image Enhancement Technology (IPC)TM implemented through the IPC-4D option. The IPC-4D card supports dynamic thresholding, image emphasis, OCR smoothing, and noise removal as well as other features. An expansion slot on the Fi-4340C allows for grayscale output when supported by controller vendors. The duplex document feeder supports paper sizes from A8 (52mm x 74mm) to letter and legal sizes. Dual CCDs scan both sides at once to reduce paper handling and improve accuracy. 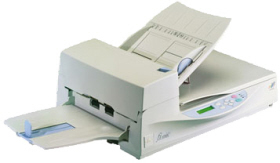 The Fi-4340C is completely compatible with existing Fujitsu scanners and interface boards. Use it as a stand-alone, as part of a larger system, or to create special applications. An optional RS232C/video interface allows simple interfacing with leading controllers. A standard SCSI-2 interface allows easy connection to industry-standard SCSI controllers. The Fi-4340C also works seamlessly with complete document management systems.